The Obama White House is serving as a convenient new employer for members of the media as news outlets downsize, but would they have felt so comfortable coming aboard a GOP President's staff? The latest hires: Three news photographers -- from Time magazine, Cox Newspapers and U.S. News & World Report magazine -- are joining the team of photographers snapping pictures at events and meetings in and around the White House complex. The chief White House photographer, Pete Souza, “announced the hires to PDN,” DCRTV.com reported Thursday in picking up the item from the week before on the Photo District News site. 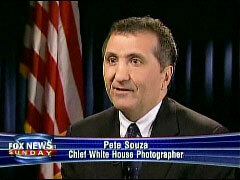 Souza had already tapped photographers from the McClatchy-Tribune News Service and the Associated Press.